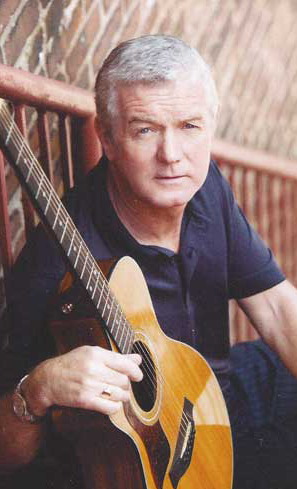 With over 30 years in the music business, Harry O’Donoghue has become a master folksinger, storyteller and songwriter. His comfortable easygoing manner has become a trademark. On stage with acoustic guitar, bodhran and his gentle voice, Harry weaves and interconnects a pattern filled with history and culture, his songs telling the story of Ireland past and present. Add with that his quick wit, engaging humour and ability to draw an audience into his show and the result is a wonderfully enjoyable and memorable experience. Born and raised in Drogheda on the banks of the River Boyne, just three miles inland from the Irish Sea, Harry began his musical career when he was twenty, performing at Folk Masses and for the Irish Wheelchair Association, among others. In 1979 he was a founding member of the group Terra Nova and by the mid-eighties they were touring the U.S. and signed to Polydor Records. When the group performed their last concert in 1987 Harry embarked on what would become a hugely successful solo career. Harry has performed, by invitation, with the Savannah Symphony and has shared the bill with such international recording artists as Mary Black, Cathie Ryan, Andy M. Steward, Natalie McMaster, the Furey Brothers, Tommy Makem, Danny Doyle and others. He performs throughout the U.S. and Ireland in a variety of settings, from concerts to colleges, cruise ships, festivals, clubs, private events, conventions and singer/songwriter showcases all of which testify to the universal appeal of his warm and entertaining musical style. Active in the Savannah community he calls home, Harry co-produces and hosts “The Green Island Radio Show” broadcasting weekly on Georgia Public Broadcasting and streamed live on the Internet at GPB.org. Interviewing touring artists and reviewing and airing new Celtic music has kept him in touch with the Irish music scene. He also hosts singing workshops, passing folk songs along in the oral tradition. More of his Irish background can be seen with the tour groups he organizes and takes to Ireland annually, something he delights in and has been doing for many years. He also customizes tours of Ireland for private groups. Well respected in his community, Harry sits on the advisory board of the Centre for Irish Studies at Georgia Southern University and was voted Best Acoustic/Folk Artist by the readers of Connect Savannah every year since 2001 until the category was eliminated. To book Harry for a concert performance, festival, private event, club, cultural workshop, singer/songwriter showcase or organize a tour to Ireland, please contact him through this web sites “Contact Us” link.